When it comes to holiday eating, I would pick chips and dips, and breads and spreads, over Christmas cookies or candy any day. (Well, actually I’d probably eat all of it if given the chance.) There’s something so comforting about a piece of crusty baguette or a savory chip piled high with creamy goodness. Unfortunately, most dips and dippers aren’t super healthy for you, and since you’re taking such small bites it’s really easy to overdo it. Which is why I love this acorn squash dip. Back when I worked at a natural foods co-op, I made a batch of Frontier Co-op’s acorn squash dip recipe for a demo. I never would have thought to use squash as a dip base, but I fell in love with the texture and how easy it was to change up the flavor. After tweaking it many times over the years, I’ve come up with my perfect version: one that’s slightly sweet and extra flavorful thanks to caramelized onions. I leave the yogurt out in my version, but you can certainly add some plain Greek yogurt in if you like your dip a little creamier. (I would recommend using a full-fat yogurt.) It’s ideal to eat on slices of crusty French bread, but crackers, veggies or chips will work just fine. 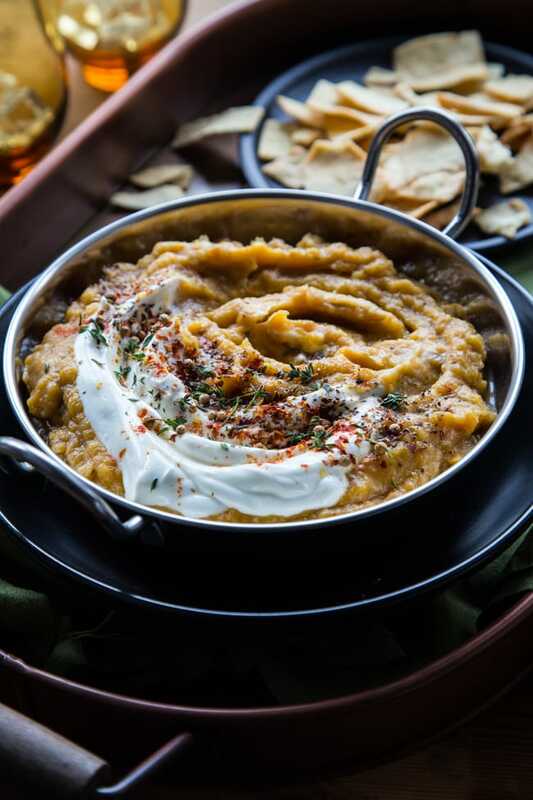 And even if you overdo it on this dip, you don’t have to worry too much since it’s loaded with nutritious acorn squash and the savory flavor comes from the spices, balsamic vinegar and onions, rather than the usual suspects: salt and fat. This flavorful dip will be the hit of your holiday party! Adapted from Frontier Co-op’s Acorn Squash Dip. Place the squash, flesh side up, in a baking pan with high sides, pouring about an inch of water in the bottom of the pan. Cover the squash with foil and bake for 45 to 60 minutes, or until fork tender. While the squash is baking, heat a large skillet over medium-low heat and add in just enough olive oil to coat the pan, about 1 tablespoon. Add the onions to the pan and stir to coat with oil. Let the onions caramelize over medium-low heat, stirring occasionally, for 30-35 minutes, or until the onions are a deep brown. As the pan dries out, add in a splash of stock, white wine or water to deglaze, then stir. The onions should be soft but not mushy when they’re done. Add the minced garlic to the pan about 10 minutes before the onions are finished caramelizing. Remove the onions from the heat and set aside. Remove the squash from the oven and allow it to cool enough to handle. Scoop out the squash flesh into a food processor or blender. Add the onion mixture, honey or maple syrup, balsamic vinegar, lemon juice and spices to the processor and blend until just smooth. Serve warm, cold or room temperature as-is or add in yogurt, a drizzle of Sriracha or another hot sauce, and/or cilantro, thyme, paprika and/or cumin for garnish. 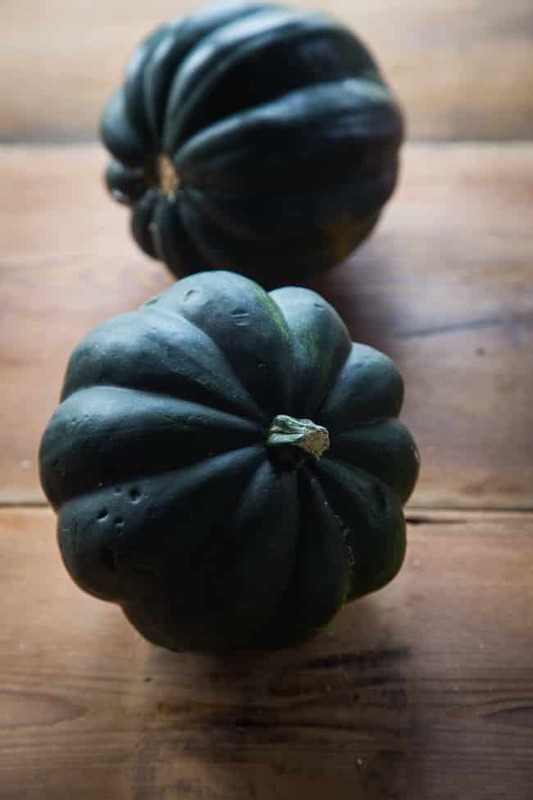 Ahhh so much to love- one last squash fix before they go out of season, a lightened up dip without a ton of heavy cheese, and make ahead/batch cooking friendly. SO GOOD!! This looks like such a fantastic holiday dip or perfect on a slice of sourdough toast! Looks fantastic! I’d have to call it “onion dip” and let everyone try it first. Such a cool idea for a dip! I love to change up the standard dips and give people something new. They usually love it! I feel like I am always bringing hummus to parties and this sounds perfect to bring to a holiday potluck! This dip looks delicious how much in advance could I make this, I’m looking to make dips for Christmas & would like to start a couple of days ahead. Hi Christine, If you want to serve it warm or room temp, I would make it right before serving. But if you want to serve it cold you could probably make it a day ahead. If you add the yogurt, I’d wait to mix that in until right before you serve. Delicious! I used a sugar pie pumpkin because my CSA would not stop sending me pumpkins and after the 4th pumpkin and spice based dessert I was over it. Glad I found something easy and savory! Hoping my comment will help this turn up this recipe when people search for savory pumpkin uses. I roasted the pumpkin flesh down and with no added water just salt. I halved the recipe but might stick with the full amount of caramelized onion next time. Mixed in a little yogurt for tang and creaminess. Too many pumpkins is a problem I’d love to have! Purée those suckers and freeze it in 1 cup portions!